Top talent from Middlesbrough Council beat off competition from across the region to land a prestigious accolade. The six-strong team scooped the overall prize in the 2018 Local Authority Challenge held at Durham County Cricket Club. The Challenge gives aspiring managers from across the public sector a rare opportunity to gain exposure and experience, as well as test and hone their local government knowledge and skills. This year’s event was contested by 27 teams representing councils from across the North East and Yorkshire. 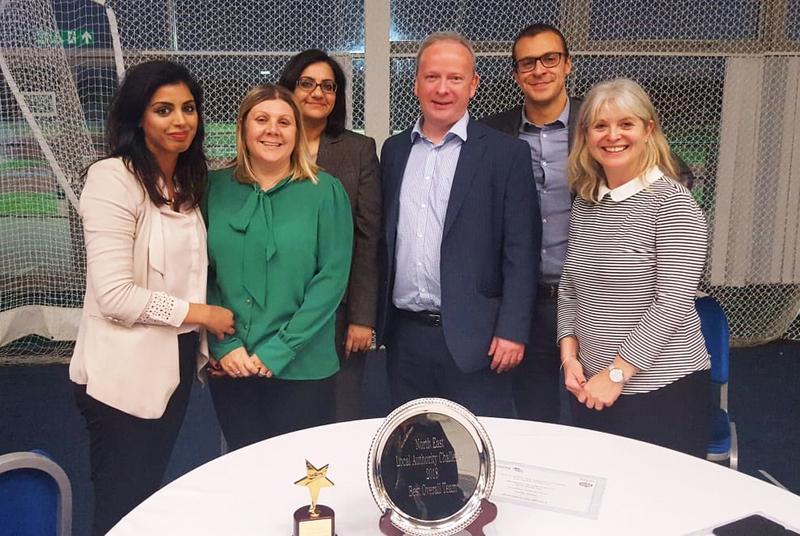 The Middlesbrough Council team comprised ‘Chief Executive’ Selinda Chouhan, supported by Kevin Brown, Trevor Dunn and Hazel Clark from Children’s Services, Debbie Ingoldsby from Growth and Place and IT Business Partner Mehmoona Ameen. The day consisted of dramatised scenarios set in a fictional local council area, with delegates tackling the sort of issues that arise in real life. The team was required to work with neighbouring councils and partner organisations to deliver a new strategy, identify priorities, tackle politically sensitive issues and maintain focus on service delivery with limited resources. At the end of an intense and challenging day, a panel of expert assessors awarded the Best Team and Best Chief Executive accolades to Middlesbrough, along with a runner-up spot in the Media category. Selinda said: “We were confronted with a scenario in which the the Chief Executive and the entire leadership management team had resigned, and we were the new team put in place to take over. “Very quickly we had to work out how to take the Council forward, manage the day-to-day running of services and balance the books. Middlesbrough Council Chief Executive Tony Parkinson said: “This was a fantastic achievement for the team, and speaks volumes about the quality of the people we have working for us. “Throughout the day the team encountered many of the tasks that a real senior management team would deal with - but all in the space of a single day. “The LA Challenge is designed to be full-on, but the team took everything in their stride.